Over the last year I’ve spoken to a lot of people about accessing their social care records, and about their experiences in care and as care experienced adults. I’m currently working back through the interview transcripts and focus group recordings, doing primary data analysis based on the coding framework we co-designed last year. I’ve been struck by how often the conversations turned to solutions. Not just to recordkeeping problems but to the bigger issues of the lack of identity, belonging and mental wellbeing that so often motivate people to go looking for their records in the first place. Revisiting these discussions has been powerful and illuminating, challenging me to think about what we, as a research team, can do to improve people’s lives. The most common answer I’ve heard is ‘more love’. People have often talked about how the absence of love, and of simple expressions of care like hugs and cuddles, left lifelong wounds for them. Accessing records is often part of the process of healing, through understanding what happened to them and why. But unfortunately records and the access process can reinforce rather than help the hurt. This is because records are so often the product of loveless or careless ‘care’: they are the tangible evidence of the way a child or young person has been turned into a task, a job and a statistic. The process for accessing records can be similarly dehumanising. Long waiting times, lost files, heavy redactions, and poor (or non-existent) aftercare seem to underline the message that you’re not important. Several people have shared common experiences of being told ‘oh we can’t find you, according to the system you don’t exist’. Others have been advised, at the point of accessing their records, that ‘there’s nothing very interesting in there’ or ‘I’ve seen much worse.’ This way of speaking and thinking about the records is felt as a commentary on the person themselves, even if that’s not what is consciously intended. To hear that you don’t exist, or that the most important events of your childhood are uninteresting is very hurtful. Generally, it shows a lack of empathy in social care recordkeeping that begins at the point of creation and carries on right through to access in adulthood. I have to admit that I’ve often wondered what MIRRA can do to make an appreciable positive difference. We think part of the answer is compassionate guidance and better training, and strong evidence to support fairer legislation, but how do we make the case? Especially at a time of diminishing financial resources, huge social work case-loads and the highest number of children in care since the 1970s. In thinking about this question I’ve been coming back again and again to love. This morning I watched a TEDTalk by Scottish care leaver and residential care manager Laura Beveridge, about the need for a revolution of love and equality for children in care. It’s a few years old now, but if you haven’t seen it, I urge you to watch it: youtu.be/E-wp7HN9Zvs . In it she talks about what it’s like to live in a world where ‘you don’t call your parent mum or dad, you call them staff’, where you have to sign an official form to get your pocket money and where what you can do and where you can go depends on a risk assessment. She talks about leaving care with a box of administrative papers rather than a memory box of photographs and mementos. This further convinced me of the fundamental importance of love in recordkeeping. Social care records have a statutory and official role in Children’s Services, but surely they also have a critical function in capturing and demonstrating the love that we want all children and young people to feel. If a commitment to social records created with and for love ran right through the recording function and on into the access process then ‘files’ could be better in lots of ways. Better at supporting and informing child-centred social work practice; better at capturing the key moments and memories of childhood; and better at helping to answer the lifelong needs of care-experienced adults. Drawing on the work of psychologist Gerard Egan (2000) Michelle Caswell and Marika Cifor (2016) have challenged recordkeepers to bring ‘radical empathy’ to their work. They define radical empathy as “a willingness to be affected, to be shaped by another’s experience, without blurring the lines between the self and the other.” By rethinking the value of social care records as evidence of love, and coming to a better understanding of why records matter to everyone involved in making and preserving them, we might come to see them as tools for caring rather than for surveillance and judgement. Increasingly I feel that bringing more love into recordkeeping has to be a key aim of our research outputs. 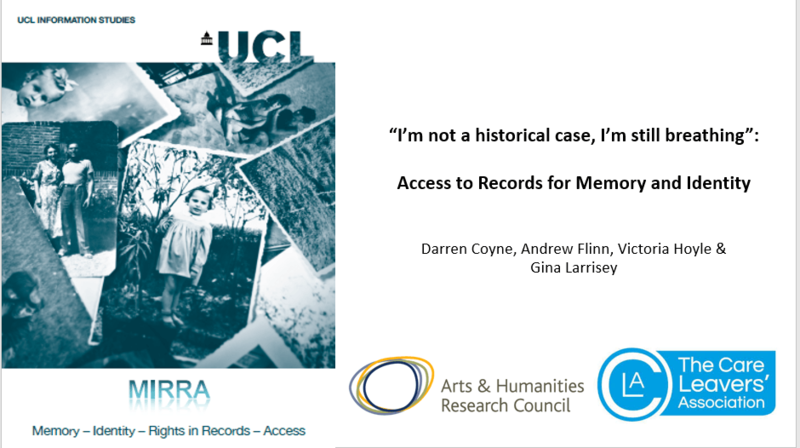 How and why are records like care records valuable for memory and identity? How can we improve the way archivists and records managers look after and provide access to them for these purposes? We left these questions purposefully open because although some people in the room worked with care records others didn’t. While we were talking specifically about care leavers’ experiences we wanted to show how the same lessons could be applied to working with any personal sensitive information, such as health or education records. After a brief introduction to the project we asked the audience to take part in a quick-fire exercise to get them thinking about what it means to rely on organisational records to tell your life story. 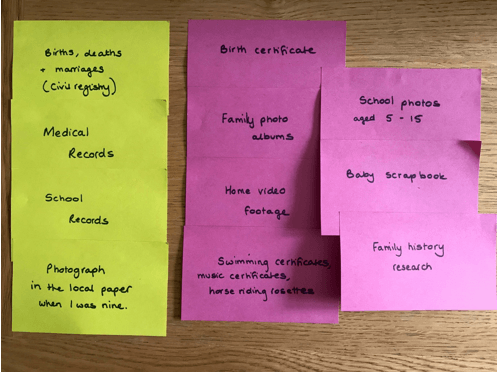 They used pink post-it notes to note down records from childhood that they or their family members had, and yellow post-it notes to write down records about them held by organisations. 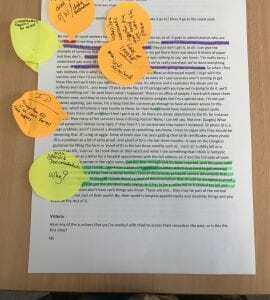 We then asked them to imagine reconstructing a narrative of events only from the yellow post-it notes as many care leavers must do. Darren and Gina then spoke about their personal experiences of accessing care files and the positive and negative impacts that it had on them. Both touched on some of the structural and practical difficulties of the access process, including navigating bureaucracy and redaction, as well as the emotional and personal challenges. Darren talked about his work with The Care Leavers’ Association supporting other care leavers to access their records, including people currently in prison. Afterwards many people said how important and powerful it had been to hear directly from care leavers and to see about how recordkeeping decisions had affected their lives. It put everyday processes and procedures into a new perspective. 2) Suggest changes that could be made to improve services to care leavers and others. Many familiar themes emerged during the discussion: the limits of Data Protection legislation, making decisions about redacting third party information, finding and identifying the right records, lack of training in how best to support the process and the emotional impact on the archivist and records manager. It was heartening to see the number of changes people thought could be made though, from the ambitious (changing the legislation) to the actionable (development of training). The key message that emerged was the importance of putting the care leaver first in the process – a response that seemed directly connected to having heard the personal stories earlier in the session. Almost half of the attendees said that they would change something in their work as a result of being at the workshop, which is a great result. Afterwards Darren, Gina and I met up with Nicola Laurent and Michaela Hart from Australia to talk about the work they have done there with the Find and Connect web resource. It was an opportunity to share the learning that they’ve done over the last ten years in supporting care leavers, former child migrants and the Stolen Generations of aboriginal children to find and access their records. We hope that in the long term we can move towards a similar level of recognition and investment in supporting care leavers’ memory and identity. The MIRRA project is mainly focused on the information rights of care leavers, and on the information responsibilities of the people who create and look after care records. However, we are also interested in issues affecting another group of people who regularly seek access to care records: academic researchers who use them in their work. This work might be in the social sciences, sociology and social work, in economics or in history. It may involve access to large anonymised datasets, to look at trends and patterns in social services, or analysis of the records of individuals (such as case files) to better understand events or practices in context. Recent examples of research using records like this includes Michael Lambert’s work on ‘problem families’ in the North West of England between 1943 and 1974, which drew on 1800 case histories, and Malkiat Thiarai’s research on using statistical analysis of anonymous data to support service planning in Birmingham. Several large scale projects are now underway to make large quantities of social care data available for this kind of research use, such as the Nuffield Family Justice Observatory. But providing researchers with access to records raises many ethical, moral and practical questions. What rights should researchers have, and what processes should be in place to ensure they access and use the information sensitively? Should the subjects of records – children, young people and care leavers – have a say in how their data is being used? How can records be created and managed in ways that support research without contravening people’s right to private and family life? Researchers acts in ways that protect the personal data, such as anonymising information or working under strict access controls. There is no likelihood that using the data would cause “substantial damage or distress” to the subjects of the data, e.g. care leavers, their families and carers. No decisions will be made about individuals based on the research, i.e. about their care. The research can’t be done in any other way without weakening it. The research also needs to have a “lawful basis for processing”, which is usually that “it is necessary for scientific or historical research in the public interest”. If a researcher can convince whoever holds the records that all of these conditions are met then they could legally be given access to significant amounts of information. Most researchers will also need to convince their University’s Ethics Committee that their work is ethical, a test that is often much stricter than the Data Protection Act. For example, they will need to consider whether it is possible to gain consent from the people the records are about, and justify why if not. They will also need to think about the implications for harm, and how they will protect against it, and provide evidence of the security measures they’re going to put in place. Many universities also require researchers to register with their Data Protection Officer. Meeting all of these criteria can be challenging and time-consuming but neither the legislation or the ethics process is designed with social care records in mind, and may not take into account some of the unique qualities and sensitivities of care records. Once researchers have permission to proceed they may find that the organisations and institutions that hold care records – such as local authorities, charities and archives – have very different procedures and standards of access. We know from our research already that some refuse completely, while others are relatively open. Some don’t have a good enough understanding or management of their paper records to provide access, and many are using digital systems that make it difficult to export and use more recent data. Although a project might be of public interest or benefit, with stretched budgets it can be difficult to justify the time and expense of working with a researcher. In some cases giving access to records is seen as too great a risk. All of this may limit the potential for learning from records. We’re interested in understanding more about all of these issues from the researcher’s perspective, so that we can put them in the context of the views of care leavers. 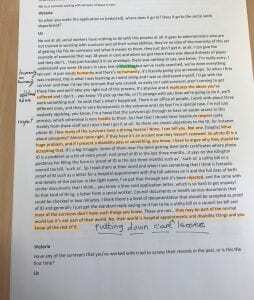 How do care leavers feel about their files being used for research? It may be a very upsetting prospect to think about a researcher reading your file, often unredacted, when you haven’t been allowed to see all of it yourself. At the same time it might be positive to think that your experiences are contributing towards improving care in the present, or a better understanding of the care system in the past. We hope to come up with some best practice guidance to help researchers and the people who manage the records navigate the moral and ethical questions better and more consistently. Early next year we will be holding a workshop with researchers to talk about and learn from their experiences, which we will integrate into the project outputs designed with our care experienced research team in 2019. If you are interested in taking part, please get in touch. We have been out and about gathering ‘data’ for the project since March. 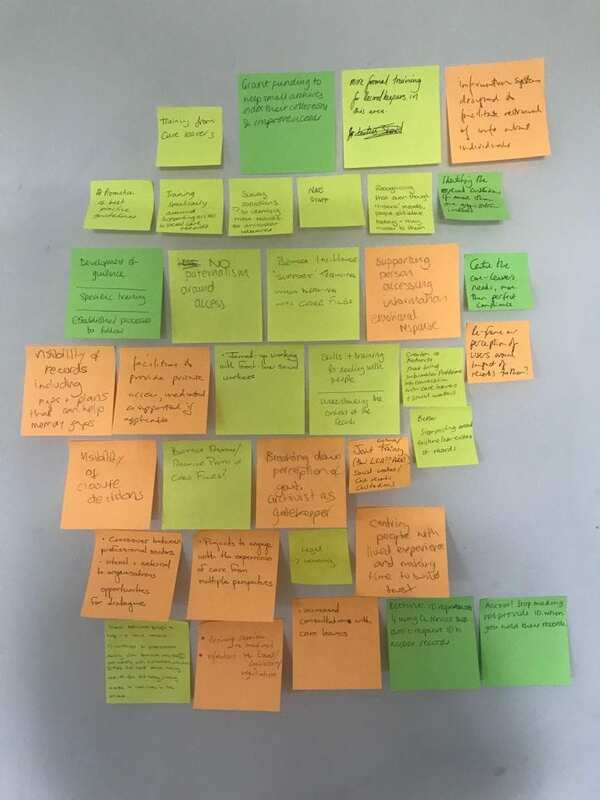 This mostly consists of transcripts of interviews and focus groups with care leavers, social care practitioners, information practitioners and academic researchers, as well as piles of post-it notes and flip-chart papers from collaborative workshops. 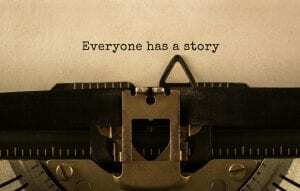 So far we have spoken to over 50 people and are sitting on a mountain of 150,000 words, and that’s just the beginning with plenty more sessions planned between now and the end of the year. Ultimately all of this will be analysed and interpreted to form the basis of the guidance, toolkits, conference papers and articles that we will produce during the project. But where do you start and how do you manage the process? This kind of data doesn’t lend itself to statistical analysis, so instead we’re using a well-established approach to qualitative data called coding. 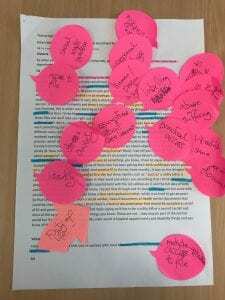 This involves reading through each interview or focus group multiple times highlighting or tagging words, sentences and paragraphs that are significant to our research themes. We use a piece of software called Nvivo to capture this process, which allows us to build up a rich and complex picture. It also means different members of the research team can work on the same data, layering up our diverse perspectives. Later on the software will help us to manipulate the codes or tags, looking at patterns and themes in the data. We can also use it to create visualisations and diagrams. A critical part of this process is establishing a coding framework: the initial set of codes that we will use to shape the analysis. Over time the coding framework will take on a life of its own, growing as we work through the data, but we have to start from somewhere. At the beginning of July the whole research team got together to start building the framework. During the workshop we began this process by working intensively on a sample of data extracts. Wielding highlighters and post-it notes we marked up and commented on things that struck us as interesting and relevant in the context of the research questions. The benefit of doing this as a team is the different viewpoints it captures at an early stage. Coding is a very individual process – every person responds to a transcript based on their own interests and instincts. Eight people will code a single paragraph in eight different ways, seeing and hearing different things. In total we looked at extended extracts from three interviews and focus groups, to build up a good basis for designing the coding framework. My job was to take these sheets away and digest them into a structure of codes that can be input into NVivo. I used a good old spider diagram to collate and group the words and phrases that the group generated. In this way I was able to identify four key areas: Access, Content of Records, Regulation and Change. Below is the diagram for Access, by far the most developed of the areas. The highlighted words/phrases are taken directly from the coding exercise; the un-highlighted codes were generated from a recorded discussion we had later in the workshop. 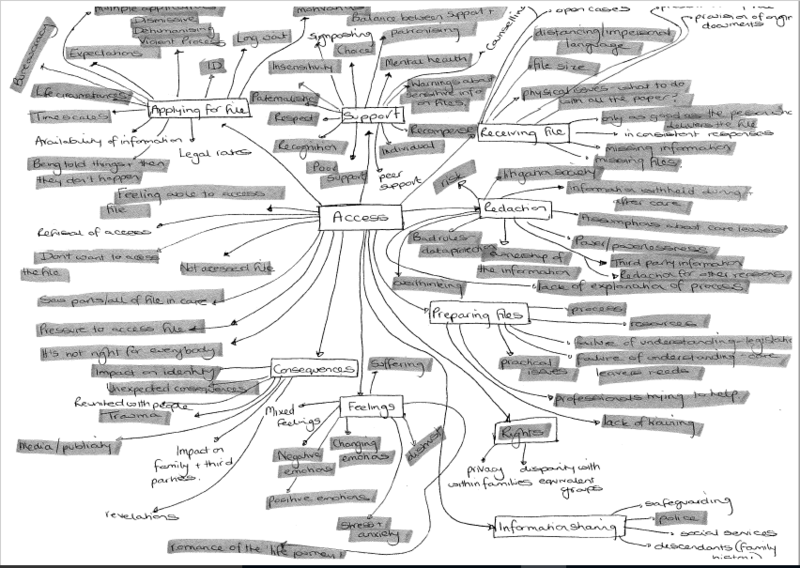 This looks very messy and chaotic at the moment, but once it has been uploaded into NVivo it looks very neat. We can start using it to code transcripts immediately, like this one from a contribution by a social care practitioner. You can see how sections have been highlighted on the left and mapped to codes on the right. Often two, three or more themes overlap as they do here. Now that we have our initial coding framework we can begin the process of working systematically through our data in this way in earnest, which should keep us nice and busy until the beginning of next year. On the 25th May 2018 the General Data Protection Regulation came into force across the European Union. This legislation was enshrined into UK law through the Data Protection Act 2018. Together these laws are intended to give greater protections and rights to individuals. All organisations that manage ‘personal data’ (and what business, charity or public authority does not!) must demonstrate that they do so appropriately. This is termed ‘privacy by design’. It places the onus on organisations to proactively consider their information management processes and the documentation of these processes. The legislation brings in far higher penalties for failing to comply with data protection law (up to 20 million Euros or 4% of turnover whichever is greater) and as such it is evident that organisations are seemingly taking notice. As guidance emerges on the implementation and bedding down of new best practices under these laws, key stakeholders need to be part of the discussions around the management and use of their information. As a result of this legislation, it is to be hoped that better care will be taken of records as the penalties for the mismanagement or loss of information are significant. To lose the file of a care leaver could cause significant damage or distress and as such is likely to be judged harshly. However, ‘privacy by design’ and the increasing reliance on documented risk assessments may mean that organisations will proactively destroy much more personal information unless they are given rigorous reasons why information needs to be kept. Whilst the records of those who are formally defined as ‘Care Leavers’ (https://www.wigan.gov.uk/Resident/Health-Social-Care/Children-and-young-people/Care-leavers/Who-is-a-care-leaver.aspx) are legally required for 75 years from the date of the record, the records of children who have a more complex picture of social care are not necessarily given such strong protections and may be destroyed far earlier. It is important to ensure that local authorities do take into account the significance of these records to individuals as sometimes they are the only affirmation of childhood memories albeit that many may not feel a need or indeed ready to access this information for decades. Those who are hoping that the new laws will enhance their access rights may be somewhat disappointed. The concept to access to the records of children who have been in care was enshrined in law through the case of Gaskin v UK (1989) 12 EHRR 36 which relied on Article 8 of the Human Rights Act to make the case for access given that this entitles an individual to respect for private and family life. However, when authorities review files they are required to consider the duties of confidentiality owed to other parties where their information is also on record. This is a balancing exercise which is often subjective. It would aid this process if clearer guidance were provided to enable an authority to weight the Care Leavers’ rights in these cases and thus err on the side of release. Some authorities do take this stance given that the damage or distress caused to an individual when information is withheld is not insignificant. Finally, it is to be acknowledged that many Care Leavers will not want ‘the State’ to retain the record of their childhood and may be hopeful that the ‘Right to be Forgotten’ under the law will enable them to request that their files will be destroyed. Sadly, the right to be forgotten is quite limited. Where authorities have a legal basis for retaining the information and in certain cases a legal responsibility to do so it is unlikely the information will be destroyed. If records have been formally archived in accordance with the exemptions provided for ‘archiving in the public interest’ then there is an exemption from the right to be forgotten. There is also a potential exemption from subject access requests e.g. depending on the extent to which the record is accessible/structured. The new draft archival guidance in this sphere states, that whilst archives may not be legally required to respond a subject access request they can choose to do so “especially when an individual’s rights or entitlements seem to be at stake”. The guidance is currently open for comment at http://www.nationalarchives.gov.uk/documents/information-management/guide-for-public-comment.pdf . In conclusion, whilst the new legislation offers a step forward more specific guidance is needed to make change. Care leavers are owed more personalized consideration and regulation or at least clearer tailored guidance. I hope that through this project and other related research this can be achieved. Everyone deserves knowledge of their childhood and control over their own childhood records! This post was written by Gina Larrisey, a care experienced co-researcher working on the MIRRA project. I was around twenty six years old when I reached a point where I started to need some answers about my life. Where had I been fostered and who was I with? I was fostered at a young age so my memory of it all was hazy, remembering dribs and drabs. I had asked my Mum at some point who had fostered me but her answer was “ooohhh I don’t know.” I was shocked and upset that she didn’t know where I had been and who was looking after her child. Although there were family issues, hence my being in the care system, I found it hard to stomach that she didn’t even know where I was. There were little gaps that needed filling in and she was my family and the obvious person to have asked. It felt like pieces of jigsaw that I need to put together to complete the picture, but without knowing about that part of my life I couldn’t fit things together. That is when I wrote to Social Services requesting my care file. I retrieved an address to write to them by popping down to my local council building and asking how I went about it. There had to be a reason for this constant battle with my family. I was told it could be up to three months to hear back but it only took a few weeks whilst the information was gathered. I was then invited to a day centre to view it. A lovely social worker sat with me when I received my file as did my partner who greatly supported me at the time. Two great big brown envelopes were brought to me containing my life. I sat down and read through a lot of it straight away. There was too much to read all of it at once. There were little yellow labels to mark the most distressing parts. Some things I already knew, some had been dormant memories, others were shocking revelations. It was no wonder I had been so messed up as a child. Reading through it confirmed to me what I needed to know. I was not at fault for what had happened to me. However, I realised that it was no one else’s fault for the things that happened to me in the past either. The social worker who sat with me was very supportive and very sensitive. I have always appreciated her for that and never regretted receiving my file even though it was a huge thing to deal with. It has helped me to move on in my life and put the pieces of the puzzle together. Gina has written a book about her care experiences and her life since leaving care if you’d like to know more about her journey. It’s called From Care to Somewhere. Although the Panel is not exclusively focused on the care-experienced community many of IICSA’s investigations and findings touch on issues that are relevant to our research. The release of the Panel’s interim report in April this year underlined that records and recordkeeping are high on their agenda. The report is a 100+ page summary of the findings and recommendations IICSA has made so far from its 5 public investigations and the 1040 personal accounts of abuse by victims and survivors shared through The Truth Project. The first Truth Project report found that around a quarter of witnesses had experienced sexual abuse whilst in care. Both reports make for difficult but essential reading, setting out the lifelong impacts of childhood sexual abuse and trauma, and confronting the ways in which our institutions have perpetuated and enabled it. What makes IICSA’s interim report particularly relevant to MIRRA are the numerous references to the importance of records: as evidence for the investigation but also as personal resources for the victims and survivors of abuse. In some cases they have been critical to the Inquiry’s work. For example, records relating to Knowl View School in Rochdale showed that the local authority had been aware of sexual abuse allegations and had ignored them despite denials made at the hearing. In other cases poor records management or the complete absence of records has frustrated the process. The Royal Overseas League, for example, has kept almost no information relating to its programme for migrating children to Australia. The same was found to be true at Cornwall County Council. The Inquiry stated that this could not be treated as an ‘unwitting oversight’ but ‘indicates a failure to have the welfare and needs of the children as priorities.’ The poor quality of recording and the mismanagement of records was an indicator of the quality of care that was received. The lack of records or their poor management also ‘caused distress to the former child migrants who were affected’ throughout their lives. The report recognises that poor recordkeeping prevents people from understanding their own histories and identities and delays them finding family members, including living parents and siblings. In the themed findings of the report there is specific recognition that ‘Adult victims and survivors often face difficulties when trying to access records about their childhoods.’ Later on the report extends this observation to say that it is true for anyone trying to discover information about their childhood in care. This closely matches what we are finding in our research. This is a technical and complex area of public policy. There are different rules for the retention of records across the different institutions covered by the Inquiry’s Terms of Reference and the quality of record keeping also varies significantly… The Inquiry will consider whether it can recommend changes that would particularly benefit victims and survivors of child sexual abuse. During our visit to the Inquiry Elizabeth and I had the opportunity to discuss these changes and how our research could provide evidence to support the Inquiry’s recommendations in this area. The Australian Royal Commission into Institutionalised Responses to Child Sexual Abuse made a very strong and useful set of recommendations around recordkeeping and information sharing in its final report last year that could provide a model for England and Wales. Independent Inquiry into Child Sexual Abuse. 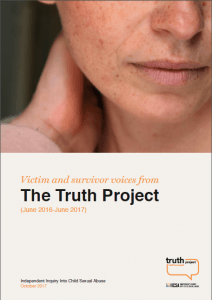 “Victim and Survivor Voices from the Truth Project.Pdf.” IICSA, 2017. 66. Independent Inquiry into Child Sexual Abuse, “Interim Report of the Independent Inquiry into Child Sexual Abuse.” IICSA, 2018. 43. Independent Inquiry into Child Sexual Abuse, “Child Migration Programmes Investigation Report.” IICSA, 2018. 109. IICSA, “Child Migration Programmes Investigation Report.” 112. “Interim Report of the Independent Inquiry into Child Sexual Abuse.” 40. “Interim Report of the Independent Inquiry into Child Sexual Abuse.” 68. “Interim Report of the Independent Inquiry into Child Sexual Abuse.” 72. This post has been contributed by a care leaver who has chosen to be anonymous. It’s the first of many posts sharing the real life experiences of people accessing their social care records. I am going to share my story about my care records, but I am not going to share my name. That is not because I am embarrassed or ashamed of my care past – I have long ago come to terms with that – but because the information being shared would cause embarrassment and possibly distress to members of my family. In formation recorded about children in care, a routine feature of daily life in the care system, is profoundly important and can have an impact not just on the subject of the records but on those close to them for generations. What is written, how it is written and the language used is so very important, but how rarely this impact seems to have been a consideration over the years. I am a retired social worker with extensive experience of residential work and regulation who has worked around the care system for many years. I know about case recording. I am also care experienced and spent my entire childhood in care in multiple placements. I entered the care system as a toddler and was separated from four of my siblings across the UK. No steps were taken to maintain contact between the sibling group and it was 40 years before I met one of my brothers for the first time. I was not given any information by social workers about why I was in care or my family background. Everything I knew I learned from older siblings who kept in touch with the older brother I was placed with. I knew very little indeed about my parents or family heritage. Many years later as a social work professional, I visited a children’s home I had been placed in as a child. I told the manager I had been placed there as a kid and he was able to find an old review report about my brother and me. He showed me one page describing us as small children. My brother was described as cheerful and outgoing, me with my nose always in a book. That was the only truly descriptive information about my background that I ever saw. Many years after I had been discharged from care I met the brother I had been separated from for 40 years. He wanted to see his care file and he had written to the local authority in whose care he had been placed. They had sent him his ‘file’. I knew from looking at it that it was a file of monthly visits to his carers made by an official from the council, not his care file. It told us little or nothing about the family. We wrote back to the council and asked for his complete file. This time he was provided with a heavily redacted file of his childhood placements, but all family and historical information had been removed. He was told that he could not see that because it included information about others including his mother who had not consented. Our mother had died many years earlier so we were not impressed by this excuse. We wrote again asking to see the family file, pointing out that our mother had died and offering the death certificate. After months, my brother was told he would be allowed to peruse the file but would have to travel to the local authority offices to see it under supervision. Recently, he sought to make arrangements to attend with his daughter. He was told the file had since been ‘lost’ and they would let him know when they found it. I was moved to seek my own care file. I wrote to the local authority who were responsible for me as a child in care. After a few weeks, I received a very polite but short letter of apology with a photocopy of what I recognised to be a ‘Movements Card’ attached. The local authority apologised to me because my file had been destroyed years earlier during some local authority reorganisation. All that they could find was this card, recording my movements through the care system from a toddler to age 18. It was a terse business-like document, like many records I had seen over the years in social work. The card included the names and dates of birth of all my siblings. One was spelled incorrectly. It included a list of placements I had lived in. That list was incomplete, missing out several children’s homes and foster placements I was placed in. The file included a contact address they had for my late mother. I knew the address. It was a hostel for homeless people. It also included a brief section including the reason for my being ‘received into care’. It included the short sentence “Mother in HMP”. That was it. I have been a social worker working in or with the care system all my life. I knew records were carelessly kept and people recorded without any thought that one day the people they were writing about might read their comments. Even so, I was shocked and angry at this single remaining record of 16 years of my life. To the local authority it was a record of movements in care (incorrectly recorded). To me it was my childhood. My care file had been a collection of old papers that were in their way when the local authority reorganised its systems. It made sense to them to dispose of it when they modernised. In doing so, they destroyed possibly the only remaining history of my life with information about me that I can now never know. My brother’s daughter is a highly skilled genealogist. 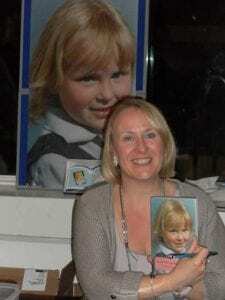 She has traced most of our family, now spread across Canada, South Africa and Australia as well as the UK. We have pieced together my family history and heritage back to the mid eighteenth century. Due to one single administrative decision made by a local council, my history from the mid twentieth century is now lost for ever. This AHRC-funded research project seeks to explore the information rights ecology in the public and voluntary sectors in order to ensure that citizens are able to exercise their information access rights and assure their data privacy, and that public authorities understand their rights and obligations. We will take a participatory approach to the research, which will focus on the creation and management of care records and data, held by different kinds of voluntary and public authorities, specifically records relating to children’s services.